print Print What is a healthy food diet for pet rabbits? Fresh, clean drinking water and good quality hay and grass should make up the majority of your rabbits' diet. A rabbit's digestive system needs hay or grass to function properly so a healthy supply is extremely important. You can supplement with leafy greens and a small amount of pellets. Root vegetables such as carrots or fruit, should only be given in small portions as a treat, as rabbits don't naturally eat these type of foods. Always avoid muesli-style food, as these are unhealthy for rabbits and has a number of associated health problems. Fresh clean drinking water continuously, checked twice daily. Ensure water doesn't freeze in winter. Without water rabbits become seriously ill.
Good quality hay and/or grass, always available, should constitute the majority of rabbits' diets. - Rabbits graze, naturally eating grass/other plants for long periods, mainly at dawn and dusk. - Rabbits' digestive systems need grass and/or hay to function properly. - Read meal planner and feeding tips. Hay and/or grass as they're much more important than commercial rabbit pellets ('nuggets'). - If giving pellets, follow manufacturer's instructions. - Don't top the bowl up as rabbits might stop eating enough hay and/or grass. - Growing/pregnant/nursing/underweight rabbits may need larger portions. Healthy diets. Avoid muesli-style foods as they are associated with health problems. See muesli is unhealthy for rabbits for advice on transferring rabbits to healthier diets. Contact your vet for dietary advice. - Rabbits' teeth grow continuously, needing wearing down and keeping at the correct length/shape by eating grass/hay/leafy green plants. - Not eating the right diet results in serious dental disease. Root vegetables (e.g. carrots) or fruit only in small amounts as treats. Don't feed other treats as they may harm your rabbits. - Rabbits don't naturally eat cereals/root vegetables/fruit. Safe, washed leafy green vegetables/herbs/weeds daily. Take care - some plants are poisonous. - Avoid sudden changes in diets and do not feed lawnmower clippings as both these upset rabbits' digestive systems causing illness. Feeding quantities adjusted to prevent them from becoming underweight/overweight. - Quantities rabbits need to eat depend on age/lifestyle/general health. - Rabbits become overweight and may suffer if eating more food than needed. The amount they eat and drink monitoring. If these habits change, droppings gets less/stop, or soft droppings stick to their back end, talk to your vet immediately as they could be seriously ill.
- Rabbits produce two dropping types - hard dry pellets, and softer moist pellets they eat directly from their bottom and are dietary essentials. 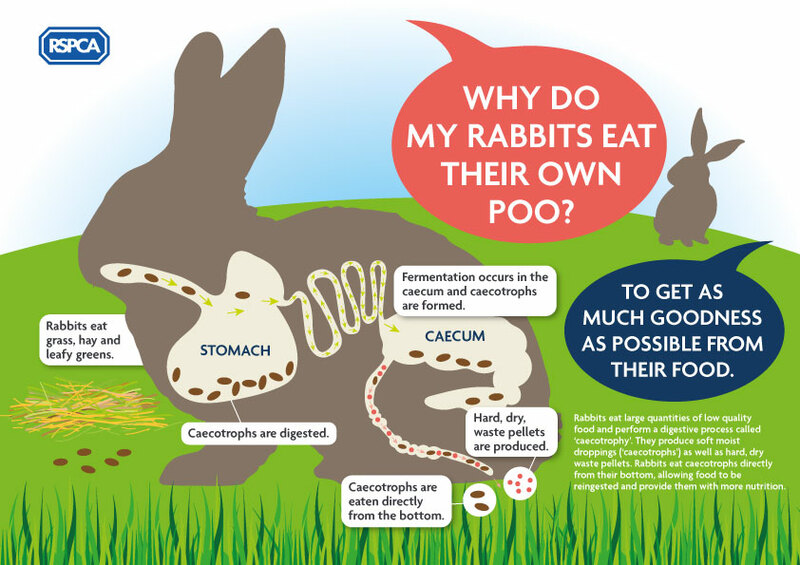 View the rabbit poo infographic to see why. Join us in some myth busting and find out what rabbits really need to eat to stay healthy.